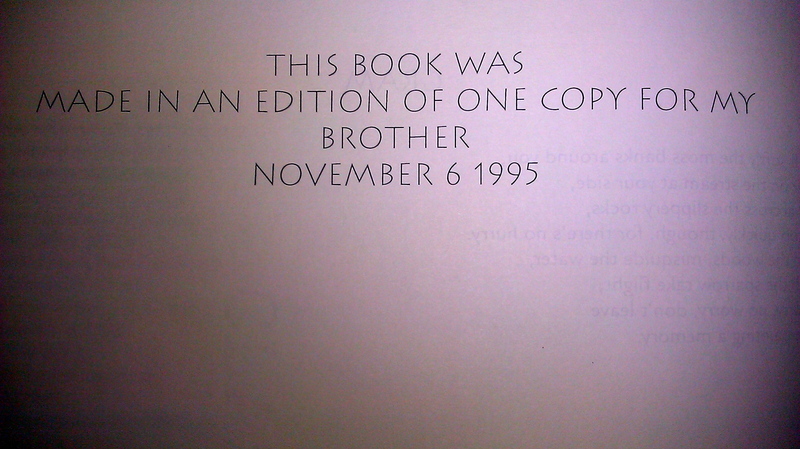 Some time ago – 17 years, to be exact – my youngest sister, Laura, gave me an unusual Christmas present. I cherish it to this day. At the time she was towards the end of her degree in print technology from the Rochester Institute of Technology. Laura’s one of the people in my life who has periodically said to me “you really should be writing”. It’s not a nag, just a reminder that there’s something I seem to like doing, do well, and don’t do. Well. Something that I wasn’t doing, until recently. In any event, and to the point. The gift Laura had come up with was to publish me. 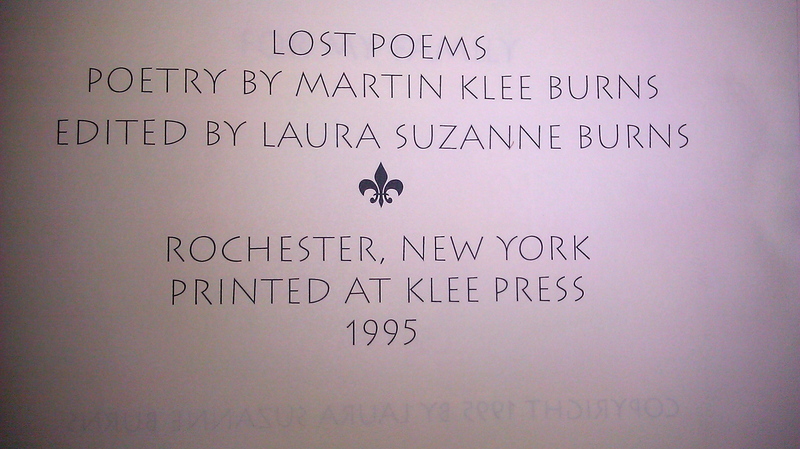 Just once, in a limited edition (of one copy, so you can imagine the value at this point) called Lost Poems. My mother was her collaborator here – she’d hung on to a few poems I’d written in middle and high school. Laura took those, put them to print, copyrighted the work (in her name, which I find interesting…), bound it all up, made a wooden box for the works, and well, gave it to me. I – understandably, I hope – cried. I even wrote a bit more at that point, before running out of gas again. One of the most remarkable things anyone’s ever done for me, and I hope in some way to repay her by taking this all more seriously, 17 years later. I’m even contemplating a fiction. Oh, my…. In Laura’s honor, I’m going to put these juvenile exercises up in this tab (replete with this note as the intro/ explanation, etc), in the order she chose to place them in the book. Feel free to take a peek. I can’t defend their optimism, how they often tell instead of show, imagery, or overall lack of talent. But, I can say they were sincere and heartfelt, and in that they have much in common with the wonderful gift I unwrapped that Christmas morning. Thank you Laura – all my love. I see my blur in the mirror. off to work – Dad left at seven. Rice Crispies; the dog trails me. and pour it over my Rice Crispies. as I rub at the scab on my chin. **author’s note: I’d recently read Plato’s “The Cave” for the first time, as I was in fact a nerd and read things like that in high school when I should have been trying to kiss girls. As I recall, I was trying to make some sort of statement related to it. if there is room for just one more. **authors note…. yeah. I got nothing. The children were the hardest part. Ready to fly on a child’s breath. But there were no children. Mouthed little syllables and sounds of love. We were helpless as children. The move would have done us good. And I was no Samson. **AP English writing assignment, where we were supposed to place ourselves in the shoes of one of our parents. Up at the Bread Loaf Young Writers Conference, I took that suggestion and ran with it, while sitting on a rock in the middle of Brandy Brook next to a girl named Gretchen I’d fallen head over heels with. I wondered “what if she loves me, back, and we marry here in these woods, build a house in some bee-loud glade, and then it all goes to hell?” Also: yes, I know. My adolescent fantasies left something to be desired. There was nothing good about the day. Then my father arrived and his grief was great. Our faces sad miserable, but we drove. But none like the night of that ride. **This one… well, it’s the first poem I ever remember writing. My father had been out to visit his father in Rochester, New York, which is about a 7 hours west of Boston. His dad had had a minor heart attack, but seemed to be fine, so it was an easy visit. About an hour after my father left to come home, his father had a major heart attack and died. This was ages before cell phones (heck, this was before cordless phones), so we couldn’t reach him. Poor guy drove 7 hours home, walked in the door, and had to deal with the news, repack the car with his wife & 4 kids, and head back west. Tough night. About a week later (which is why I chuckle at the “when I look back at that night” line, with its implications that it was ages ago), I sat down and wrote this. from one spray can to another. are plotting revolution in the boiler room. I am sharpening sticks and chipping obsidian. hoping that the mirror will work in my defense. into amber and black shadows. **An attempt at an abstract love poem. Abstract being the operative word here, I think. It was tough to write about being in love, when I really hadn’t been yet. Just lots of Shakespearean tragedy, etc etc, to build my imagination around. **I had a solitary side to me as a child. There was a spot in a woods that I used to get to, by crossing a major highway via an underused train bridge, where I was able to get away from all human company. This one was written for my mother’s mother – not sure why, but I liked her a lot, so that may have to do as an explanation.